This entry was written by whyevolutionistrue and posted on January 18, 2015 at 4:00 pm and filed under spot the nightjar (and other beasts), spot the ________. Bookmark the permalink. Follow any comments here with the RSS feed for this post. Both comments and trackbacks are currently closed. If it is mostly tail then I thought that may be it. If not, I have no idea. I don’t get it. Spot the rock? Sure, no problem. Weeelll, now maybe. Is it ~ perpendicular in the picture? With its tail hanging down, draped over the next rock below? I see something iguana-like right behind the plants at the bottom right of the picture. Almost looks lake a leaf that is paler green (maybe?). Right below the miniature Rambo who is crouching, arms outstretched, with a white headband. 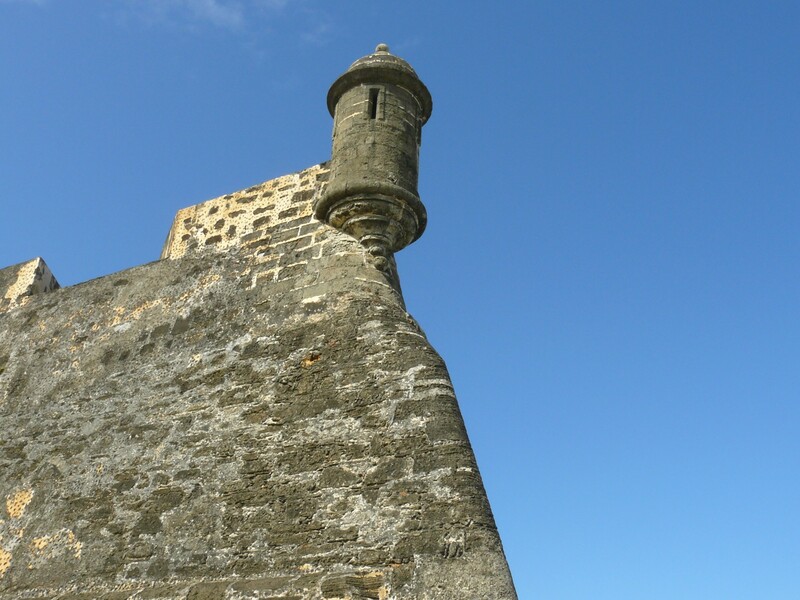 That looks like it could be part of one of the old forts in San Juan. There are tons of iguanas all over the place there, and they do find their way onto improbable parts of the rock faces. Such as here. I can’t really see a clearly-defined iguana in the picture above, though, due to the resolution. Wrong!! It looks like some prehispanic site in Mexico (maybe Mayan). You can see the decoration on the right side of the steps symbolizing a rattlesnake). The bottom stone on that side is sculpted like the rattle of the snake, then you have the body climbing on the right side and a sculpted stone the was the head of the snake at the top, but you can barely make out the shape not, as it is eroded. The filling of structures with rubble was a common building technique among the Maya. The snake sculpture dates it to the late-Mayan period, what is sometimes called the Toltec Maya. I’m experiencing Palm Squirrel withdrawal. So, the monkey is not real? The iguana — well, actually just the third claw of the left rear foot and two of the spines from the crest — is easily noticeable in the dark shadows just above the wall on the right side of the photo. I think you’re right. But everyday I look at this photo again, and I see more iguanas! No, let me correct that! I see one on the vertical part of the wall, near the top. What about the cat bottom left? Noooooooooooooooooooooo! I refuse to search for invisible creatures. The invisible and non-existent look alike. Only true believers will see the iguana. Those heretics who see a chameleon will be stoned. A door’s height to the right of the base of the door. The entire iguana is visible, with the head to the right. There also seems to be an iguana right in the niche below the lowest step, to the right. Speaking of reptiles, an intact reptile fossil, found a decade ago by a boy on a Prince Edward Island beach, is probably 300 million years old! The “niche” to the right of the 2nd big step? No, not that niche, though there could be one hiding in any of those corners we can’t seem to see around. 🙂 I meant at the foot of the lowest step, on the grass. But now I’m doubting my eyes again. I must be seeing things, as it can’t be THAT well-camouflaged! I’ve almost forgotten what we’re looking for! Yeah I think that was the tail I saw. I also agree. The truth is that there are probably a BUNCH of iguanas and other lizard taxa, such as geckos, in the photo. I climbed that really steep pyramid at Chichen Itza back in the 70s. I was paying way too much attention to my footing to look for any iguanas. And speaking of iguanas, my dog has a 3 foot long squeaky stuffed one which I found our tiny new kitten, Carmen, dragging around by its tail this morning. She also hides behind Iggy to jump her brother, Booker, and the dog. Ditto. We’ve done a number of pyramids in Mexico, including “Chicken Pizza” (our guide was very jokey), as well as the ruins in Tulum, by ourselves. Even went hiking off the beaten path into the hills. I’d never travel anywhere in Mexico by myself anymore. Sad how times have changed, as it’s a spectacular country. Took a photo of tiny green snake on a fallen down wall in Tulum. It looked ready to strike, as it watched me closely with part of its body extending way out from its support. That was many years ago, so the photo is buried in a box somewhere. There’s just something about Iguanas and Mayan temples.